Known for his wit, humor, breadth of knowledge and love of the legal profession that characterized both his teaching and his life, Professor Emeritus Dan Reynolds lost his battle with cancer on Friday at the age of 71. Professor Reynolds joined the College of Law faculty in 1982 and stayed until his retirement in November 2015. During that time he taught Contracts, Professional Responsibility, Corporations and Legal History, among other subjects. Reynolds also served a stint as interim dean in the 1990s. Considered an expert in the area of legal ethics, Reynolds was the assistant reporter to the American Bar Association’s “Kutak Commission,” which drafted the new code of ethics for American lawyers The Model Rules of Professional Conduct. In addition, he, along with Professor Emeritus David Gaebler, led the school’s very successful study abroad program in Agen, France for almost 20 years. Melinda Rosales Byerly, a 2003 graduate and president of the NIU Law Alumni Council, was fortunate to get to know Professor Reynolds as a teacher, mentor and friend. Professor Reynolds was loved and greatly admired especially by the students. He was voted “Professor of the Year” an unprecedented six times by the classes of 1989, 1991, 1997, 2003, 2008 and 2013. During his retirement reception in 2015, Professor Reynolds reflected in an emotional speech on his many years of teaching, service and dedication to the legal community. He talked about his incredible journey throughout his career and how much he learned from his students and colleagues. “Being a part of the professional formation of so many judges and lawyers over the years has been the great privilege of my life. I thank each and every one of them for that experience,” Reynolds said. “His impact on the lives of NIU graduates cannot be overstated, nor can his contribution to the college. I will miss him tremendously as a friend and as a colleague, but am grateful for the many fond memories he left with all of us,” Dean Cordes said. 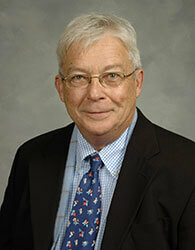 The College of Law will have a special memorial service for Professor Reynolds later in the semester. Additional information will also be provided about other services as it becomes available. Please post pictures and tributes to Professor Reynolds on Facebook.